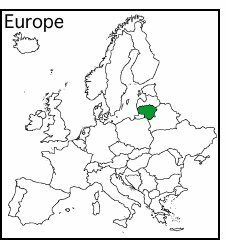 1 Lithuania is a small country. It is in northern Europe. It lies along the Baltic Sea. Hundreds of years ago Lithuania was very strong and powerful. Today it is a small land of farms, forests, and lakes. 2 Lithuania does not have many natural resources. It has rich soils for farming. It also has many forests of pine, fir, and birch trees. There are almost no minerals in Lithuania. But there is one beautiful stone that Lithuania is known for. It is called amber, and Lithuania has a lot of it! Amber is very pretty stone. It is also very expensive. This is why it is called Lithuania's gold. 3 Amber is a very interesting stone. It comes from the sap of pine trees! You might ask how could hard stone come from liquid sap? Well, it takes millions of years. Millions of years ago pine trees were already growing along the coast of the Baltic Sea. They grew old and fell down. After they fell, they were covered with dirt and water. Sap inside those trees became harder and harder, until finally it turned into beautiful stones.